Top 8 Terrible Video Game Sequels – Grand Theft Auto 4, Mega Man X7, MoreMarc Morrison (April 16, 2019)From Mega Man X to Elder Scrolls, GTA and more, 411mania’s Marc Morrison counts down his list of the Top 8 Terrible Video Game Sequels inside! The 8 Ball: Top 8 Unconventional Video Game Sequels – Mario 64, Street Fighter, 2, MoreMarc Morrison (April 9, 2019)From Fallout 3 to Sonic Adventure, Resident Evil and more, 411mania’s Marc Morrison counts down his list of the Top 8 Unconventional Video Game Sequels inside! Justice Velocity Designer On the New RPG’s Video Game Inspirations, the Challenges of Vehicular Combat & MoreJeremy Thomas (March 15, 2019)The designer of the new Polyhedra Games roleplaying game Justice Velocity spoke with 411 about the game's inspirations, tackling vehicular combat and more. Travis Willingham and Sam Riegel On the Success of Critical Role’s Animated Kickstarter, Future Plans & MoreJeremy Thomas (March 12, 2019)Critical Role's Travis Willingham and Sam Reigel speak with 411 about the success of their animated series Kickstarter, what's next for the brand and more. The 8 Ball: Top 8 Japanese Game ComposersMarc Morrison (March 12, 2019)From Koji Kondo to Miki Higashino, Shoji Meguro and more, 411mania’s Marc Morrison counts down his list of the Top 8 Japanese Composers inside! Overwatch League Power Rankings: Week 3Jeremy Thomas (March 7, 2019)Which teams are on the top at the middle of the first stage of the Overwatch League, and who's at the bottom? 411's Jeremy Thomas takes a look in this the latest Overwatch League Power Rankings. The 8 Ball: Top 8 Game Franchise Revivals – Sonic Mania, God of War, MoreMarc Morrison (March 5, 2019)From Marvel vs. Capcom 3 to Sonic Mania, XCOM and more, 411mania’s Marc Morrison gives his list of the Top 8 Franchise Revivals in Video Game inside! The 8 Ball: Top 8 Oddest Franchise Games – Mario is Missing, Zelda’s Adventure, MoreMarc Morrison (February 26, 2019)From Zelda’s Adventure to Chocobo Racing, Mario is Missing and more, 411mania’s Marc Morrison counts down his list of the Top 8 Strangest Franchise Spinoff Games inside! Overwatch League Power Rankings: Week 1Jeremy Thomas (February 21, 2019)Week one of Overwatch League is done and delivered plenty of surprises. Where do the teams rank going into week two? Jeremy Thomas takes a look. The 8 Ball: Top 8 Video Pinball Games – Sonic Spinball, Space Cadet Pinball, MoreMarc Morrison (February 19, 2019)From Sonic Spinball to Space Cadet, Kirby and more, 411mania’s Marc Morrison counts down his list of the Top 8 Video Pinball Games inside! Overwatch League Season 2 Pre-Season Power Rankings (#10 – 1)Jeremy Thomas (February 14, 2019)411's Jeremy Thomas concludes his pre-season power rankings for the Overwatch League just ahead of Thursday's season two launch. Overwatch League Season 2 Pre-Season Power Rankings (#20 – 11)Jeremy Thomas (February 13, 2019)Which teams in the Overwatch League are looking the strongest as we head into the highly-anticipated second season? Jeremy Thomas begins his pre-season Power Rankings with #20 through 11. The 8 Ball: Top 8 Terrible Gaming Franchises – Duke Nukem, Star Fox, MoreMarc Morrison (February 12, 2019)From The Sims to Crackdown, Fable and more, 411mania’s Marc Morrison counts down his list of the Top 8 Terrible Gaming Franchises inside! Keith Baker Talks w/411 About Eberron’s Return to D&D, Future Books & MoreJeremy Thomas (February 6, 2019)Eberron creator Keith Baker sits down with 411's Jeremy Thomas to discuss the setting's return to D&D, possible future books and more. The 8 Ball: Top 8 Saddest Game Company Closures – Konami, LucasArts, MoreMarc Morrison (February 5, 2019)From Pandemic to Clover, Smilebit and more, 411mania’s Marc Morrison gives his list of the Top 8 Saddest Defunct Video Game Companies inside! The 8 Ball: Top 8 Gaming Predictions of 2019 – Day Gone, PS5, MoreMarc Morrison (January 29, 2019)From EA troubles to the PlayStation 5 to Gamecube emulation, 411mania’s Marc Morrison counts down his list of the Top 8 Gaming Predictions of 2019 inside! The 8 Ball: Top 8 Most Anticipated Games of 2019 – Kingdom Hearts 3, Judgement, MoreMarc Morrison (January 15, 2019)From Judgement to Wild, Psychonauts 2 and more, 411mania’s Marc Morrison counts down his list of the Top 8 Most Anticipated Games of 2019 inside! The 8 Ball: Top 8 Games of 2018 – Red Dead Redemption 2, Super Smash Bros Ultimate, MoreMarc Morrison (January 8, 2019)From Detroit to Persona, Tetris and more, 411mania’s Marc Morrison gives his list of the Top 8 Games of 2018 inside! The 8 Ball: Top 8 Disappointing Games of 2018Marc Morrison (January 1, 2019)From Red Dead Redemption 2 to Fallout 76 and more, 411's Marc Morrison counts down his list of the Top 8 Disappointing Games of 2018. The 8 Ball: Top 8 Wanted Marvel Ultimate Alliance 3 CharactersMarc Morrison (December 18, 2018)From Cannonball to Gambit, Blink and more, 411mania’s Marc Morrison counts down his list of the Top 8 Wanted Marvel Ultimate Alliance 3 Characters inside! The 8 Ball: Top 8 Cel-Shaded Games – Borderlands, Zelda, MoreMarc Morrison (December 11, 2018)From Crackdown to Zelda, Borderlands and more, 411mania’s Marc Morrison counts down his list of the Top 8 Cel-Shaded games! The 8 Ball: Top 8 Food-Based Games – Pepsiman, BurgerTime, MoreMarc Morrison (December 4, 2018)From BurgerTime to Sneak King, Cool Spot and more, 411mania’s Marc Morrison counts down his list of the Top 8 Games Involving Food inside! 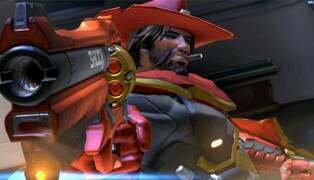 The 8 Ball: Top 8 Needed Nintendo Switch Ports – Red Dead Redemption, Mass Effect Trilogy, MoreMarc Morrison (November 27, 2018)From Red Dead Redemption to Mass Effect Trilogy, Solitaire and more, 411's Marc Morrison counts down the Top 8 Needed Switch Ports. The 8 Ball: Top 8 Animal Games – Sonic the Hedgehog, Crash Bandicoot, MoreMarc Morrison (November 20, 2018)From Deadly Creatures to Goat Simulator, Sonic and more, 411mania’s Marc Morrison counts down his list of the Top 8 Animal Hero Games inside! The 8 Ball: Top 8 Voice Casts in Video GamesMarc Morrison (November 14, 2018)From Mass Effect 2 to Assassin’s Creed, Fallout and more, 411's Marc Morrison gives his list of the Top 8 voice casts in video games. The 8 Ball: Top 8 Worst Video Game Main Characters – Duke Nukem, Bubsy, MoreMarc Morrison (November 6, 2018)From Tidus to Ryder, Bubsy and more, see 411mania’s Marc Morrison’s list of the Top 8 Worst Video Game Main Characters inside! The 8 Ball: Top 8 Video Game Prequels – Metal Gear Solid 3, Yakuza 0, MoreMarc Morrison (October 30, 2018)From Halo: Reach to Suikoden 5, Metal Gear Solid 3 and more, 411mania’s Marc Morrison counts down his list of the Top 8 Video Game Prequels inside! The 8 Ball: Top 8 Western Games – Oregon Trail, Call of Juarez, MoreMarc Morrison (October 23, 2018)From Oddworld to Call of Juarez, Hard West and more, see 411mania’s Marc Morrison’s list of the Top 8 Western Games inside! The 8 Ball: Top 8 Wanted Kingdom Hearts Worlds – Ducktales, Inside Out, MoreMarc Morrison (October 16, 2018)From Inside Out to the Muppets, Ducktales and more, 411mania’s Marc Morrison counts down his list of the Top 8 Wanted Kingdom Hearts worlds inside! The 8 Ball: Top 8 Sega Genesis Soundtracks – Sonic 3, Toejam and Earl, MoreMarc Morrison (October 9, 2018)From Castlevania to Comix Zone, Gunstar Heroes and more, 411mania’s Marc Morrison counts down his list of the Top 8 Sega Genesis soundtracks inside! The 8 Ball: Top 8 Super Nintendo Soundtracks – Super Mario RPG, Donkey Kong Country, MoreMarc Morrison (October 2, 2018)From Castlevania to Zelda, Killer Instinct and more, 411mania’s Marc Morrison counts down his list of the Top 8 Super Nintendo Soundtracks inside! [PODCAST] Video Games 2 the MAX: TellTale Games Layoffs, Marvel’s Spider-Man, PlayStation ClassicSean Garmer (September 27, 2018)Sean Garmer and Marc Morrison look at the TellTale Games layoff, Spider-Man for the Playstation 4 and more in the latest Video Games 2 the Max. The 8 Ball: Top 8 Wanted PlayStation Classic Games – Street Fighter Alpha 3, Vagrant Story, MoreMarc Morrison (September 25, 2018)From Tomba! To Street Fighter Alpha 3, Legend of Dragoon and more, 411mania’s gives his list of the Top 8 Wanted PlayStation Classic Games inside! The 8 Ball: Top 8 Law Enforcement Games – Red Dead Redemption, LA Noire, MoreMarc Morrison (September 18, 2018)From Police Quest to Max Payne, Driver and more, 411mania’s Marc Morrison counts down his list of the Top 8 Law Enforcement Games inside! The 8 Ball: Top 8 Criminal Games – Yakuza, Grand Theft Auto, MoreMarc Morrison (September 11, 2018)From Yakuza to Hitman, Gunpoint and more, 411mania’s Marc Morrison counts down his list of the Top 8 Criminal Games inside! [PODCAST] Video Games 2 the MAX: Xbox All Access, Dragon Quest XI, The MessengerSean Garmer (August 29, 2018)411's Sean Garmer and Marc Morrison discuss Dragon Quest X, World of Warcraft: Battle For Azeroth, Xbox All Access and more in the latest Video Games 2 The Max. The 8 Ball: Top 8 Spider-Man Games – Spider-Man: Web of Shadows, Marvel: Ultimate Alliance, MoreMarc Morrison (August 28, 2018)From Arcade’s Revenge to Maximum Carnage, Spider-Man 2 and more, 411mania’s Marc Morrison counts down his list of the Top 8 Spider-Man games inside!